Wide format printer solutions, including large format printers, engineering copiers and large format scanners from Paradigm Imaging Group. Click here to check out the benefits of an EIS System! BERTL OUTSTANDING 4.5 STAR Rating! The EIS Supra combines Best-of-Breed technology from Graphtec, Canon and Paradigm Imaging to produce a state of art solution for FM’s, CAD/GIS and Reprographics. Manage, and electronically distribute wide format documents for technical and graphic arts solutions with our array of EIS wide format copiers, scanners, printers and document imaging workflow software. 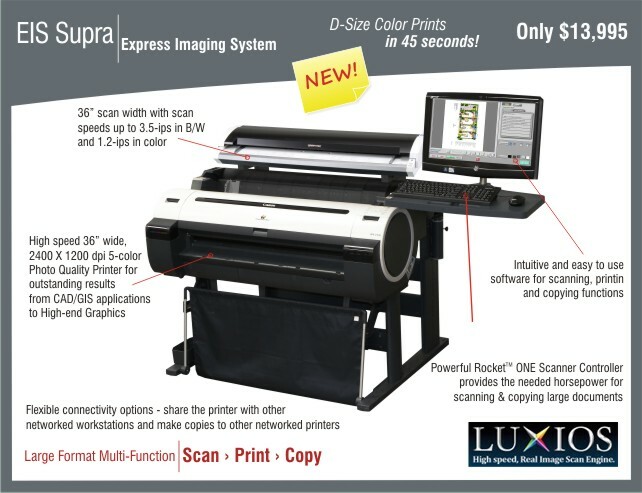 The EIS Supra large format scan, copy and print solution provides maximum flexibility to meet your needs at an affordable price. Send mail to: info@paradigmimaging.com with questions or comments about this web site.